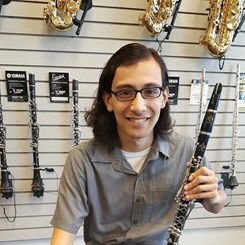 I started playing clarinet when I was in the seventh grade and I intantly knew that I wanted to play music for the rest of my life. During highschool I participated in a lot of marhing band competitions and and recieved straight superiors and had some of the highest scores in every competition that I went to. My highest achievments in high school were winning States Marching MPA my junior year and recieving straight superiors for States concert MPA during my senior year. I play multiple instruments such as clarinet, bass clarinet, tenor saxophone, percussion, piano, I also sing and I.m learning how to play bass guitar. I have decided to become a music education major as soon as I started learning at Seminole State College. I have completed the music track at Seminole State college and after I complete my AA degree at Seminole State College I'm hoping to continue my music degree at Rollins College and recieve my BA in music education there.